The belugas at the Vancouver Aquarium capture the hearts of visitors young and old and inspire people to learn more about Arctic animals and their habitat. The Arctic environment is changing rapidly due to melting sea ice, rising temperatures and increased shipping traffic. Researchers at the Vancouver Aquarium are working with the belugas there to provide the foundation for research that will help understand how these drastic changes are affecting the way belugas travel, find food, communicate and seek protection from predators. When you symbolically adopt a member of the Vancouver Aquarium family, you’re giving a unique gift and supporting the conservation of aquatic life. Symbolic adoption helps us care for the animals at the Vancouver Aquarium, and helps to fund our many conservation, research and education programs. Give a gift that keeps marine life diverse and flourishing. In addition to feeling good about your gift, you will also receive an applicable tax receipt. 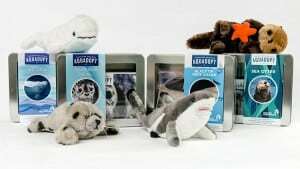 Aquadopt Kits are available on-line and in-store at our gift shop. *Orders placed after the latest recommended date may still arrive by December 25. No dates are guaranteed, but we will do all we can over the festive period to get your order to you on time. 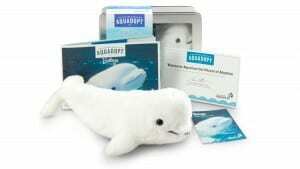 Enter for a chance to win a Beluga Aquadopt Kit. This giveaway is open to residents of Canada over 18 and where permitted by local laws to enter and win giveaways. Please ensure that you read the full terms and conditions found at the bottom of the entry form. *All Aquadopt kits that are purchased come with a $40 tax receipt. Aquadopt kits that are won in giveaways do not receive the tax receipt. I love the jellyfish at the aquarium because they look so pretty. I also love the belugas. The baby belugas are so cute and fun to watch! I’ve got a thing for dolphins, I could spend hours watching them. The dolphins are always fun to watch. I love the baby belugas! I always love visiting the penguins at the Vancouver aquarium! I love the otters – could watch them all day!